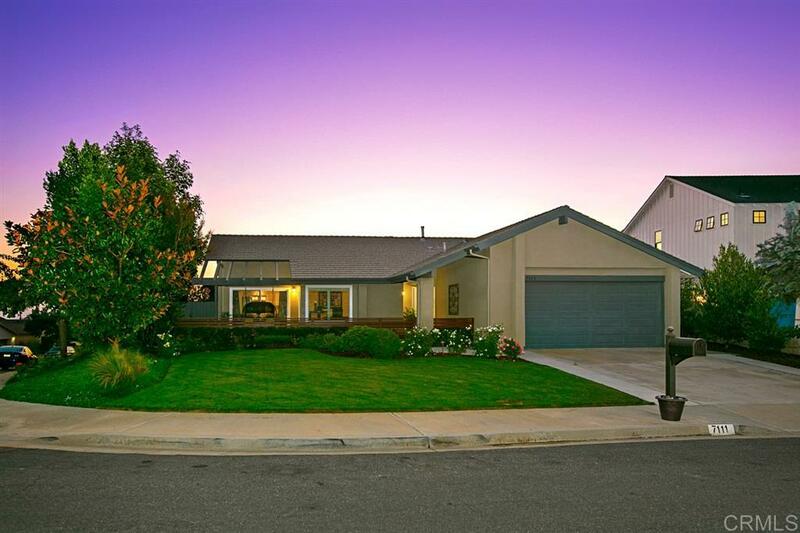 Welcome to Spinnaker Hill - one of the most desirable neighborhoods in Carlsbad! This beautiful, single-level home offers a modern, coastal design. You'll absolutely LOVE the ocean views & sunsets from your very own view deck. Year round, you'll enjoy the backyard "spool" (combination spa-pool), fire-pit, built-in BBQ and San Diego's indoor-outdoor lifestyle. Upgraded kitchen & bathrooms, tumbled travertine & wood flooring, plantation shutters – all on an elevated, corner lot. See Supp for more details!, Enjoy the Carlsbad coastal lifestyle with a short distance to Batiquitos Lagoon's local hiking trails and local beaches! The stylish and well-designed interior offers a bright and inviting kitchen with white shaker kitchen cabinets, granite countertops, subway tiled full backsplash & walls, stainless steel appliances (gas oven and stove-top), with views out to your backyard. The upgraded bathrooms include dark-finish cabinets, marble counter-tops, stylish tiles in the tub and shower areas, and multi-colored accent tiled backsplashes. This home is ideal for San Diego's indoor-outdoor lifestyle. Enjoy the grassy front yard, fenced front patio, and spacious and private backyard with easy maintenance turf. There's plenty of room to plant a vegetable, herb or flower garden - the sky's the limit! Other features and amenities include - Citrus trees, solar heating system for the spool, newer central A/C system and furnace, LED lighting, rain gutters, and a cozy fireplace in the family room. This Spinnaker Hill, Carlsbad home is truly one-of-a-kind. Visit 7111DaffodilPlace.com for more photos and details!